Our courses will take you on a tour of the valley's scenery in the shadow of Mount Tom. There is just enough elevation to keep things interesting but a PR will still be within reach. All races finish at the Fort Hill Brewery where the post race party and your free beer await! Click here for a detailed course map with elevation profiles and turn by turn directions. Get ready to take in some inspiring Pioneer Valley scenery! 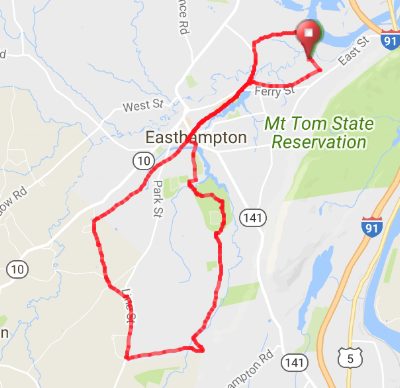 Our half marathon course follows quiet roads and shaded bike paths as it passes farm fields with views of Mount Tom. The course has only 472 feet of elevation gain with no long climbs. This will keep things fun and challenging for sure but if you want to PR or just a fun running experience then this is a course where you can get it! We will have aid stations stocked with water, electrolytes and positivity every two miles. We can describe our 5K course in just three words: fast, flat & scenic! With only 92 feet of elevation gain there are no hills to stand between you and a PR and the finish line party at the Fort Hill Brewery. Even though the course is flat your eyes will still be dazzled by the heights of nearby Mount Tom. We will have one aid station on the course stocked with water, electrolytes and plenty of encouragement to get you to the finish line. The 2019 Fort Hill Brewery Half Marathon & 5K takes place on April 14, 2019. Receive a free tech tee, if you are one of the first 250 registrants! T-shirts are $15, thereafter. The top three finishers in each age group will receive a prize as well. In addition to Fort Hill Beer, we’ll be serving up local Hillside Pizza to all finishers. Free food, free beer, a live band, and fun and vibrant vendors help make this event a destination race, year after year! Caravan Kitchen and Bruiser’s BBQ will be on site to provide more food options for this year’s event. Bib pick-up will take place at 50/50 Fitness/Nutrition (231 Russell St.) in Hadley, MA. You can pick-up your packet on Saturday, April 13th, from 12AM-2PM. You can also pickup your packet from 9:00-10:00AM on race day at the Fort Hill Brewery. Please email info@5050fitnessnutrition.com with any questions. Parking will be available at Fort Hill Brewery.. Additional parking will be available at the Northeast Center for Youth and Families located at 203 East St, Easthampton, MA 01027. This parking option is a short walk to the brewery via the bike path; we will have signs marking the way on race day. The Half Marathon starts at 10:30 am and the 5K starts at 11:00 am. We will have aid stations every 2-3 miles with water and electrolyte beverages. Porta potties will be at the start/finish area, and made available on the course. We will post more information, as we get closer to the start date.